Spring Season Help - Perelandra Ltd.
"Spring Break" doesn't mean taking a break from your Bacteria and Virus Solutions! When spring arrives, most folks stop thinking about those winter-time health challenges. But we're not out of the woods yet. There's still widespread microbial activity across the U.S., and elsewhere. Continue to take both Virus Solution and Bacteria Solution twice daily until a few weeks after all the people in your life and community stop passing stuff around. Then switch to a once daily dose for continual strengthening and maintenance. These Solutions aren't just seasonal. And if spring is a fog-headed, uncomfortable or challenging time of year for you, do this. As spring rolls in, many are already experiencing the irritation and misery that comes with the thick, yellow haze of the new season. Before your brain is so fogged you can't quite think straight, here are a few simple ways you can use the Perelandra tools to help you manage and overcome these challenges. It's not as complicated as you might think. We'll help you start. Trees may already be blooming in your area. Don't wait for problems. Now is the time to prepare and strengthen your body for seasonal changes. If spring is a challenging time of year for any reason, test a PIC List. Your focus: "Spring Season Prep and Balance." PIC List testing gives you a comprehensive readout of the Perelandra Solutions and Essences you need for addressing a specific issue, or for your general health. This approach offers personalized, expansive, in-depth support and effective results. Machaelle recommends that you do the List testing 1-2 months prior to the season so that you'll have time to build up well before the challenges arise. But you can start anytime. Now would be good! (kinesiology), to test the PIC List and find out what you need. 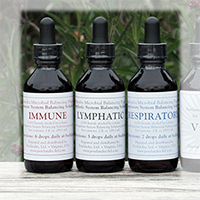 If you won't be using PIC this season, start taking the MBP Immune, Lymphatic and Respiratory Solutions twice daily for support and strengthening in light of spring issues. The MBP Balancing Solutions have a cumulative effect when taken consistently over time. The sooner you begin, the sooner you build up your foundation. If you're already taking them twice daily, or if fall is a more challenging season for you, consider yourself ahead of the curve! You might also add . . . Ongoing research is continuing to find correlations between the health and balance of the microbes in your body and a variety of issues. 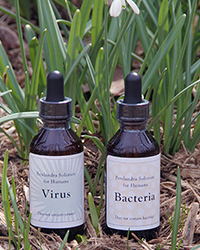 Add another element of support to your spring daily routine by taking the Bacteria Solution.